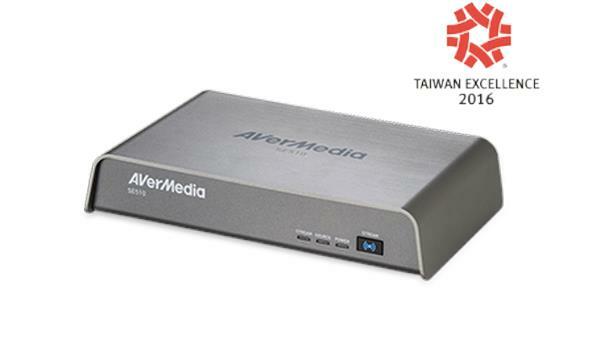 (TWSE: 2417) AVerMedia Technologies, a global leader in the frame capture market and manufacturer of digital multimedia video convergence technology, today announced that its AVerCaster Lite ( SE510) product was named and honored with the Taiwan Excellence Award. Taiwan Excellence, one of the leading measures of quality and design in Taiwan and across the world is organized by the Bureau of Foreign Trade, Ministry of Economic Affairs (MOEA) in Taiwan. The SE510 is the most versatile capturing and live streaming solution specifically designed to meet the demand for video streaming resulting from the rise in popularity of video-sharing websites such as: Youtube, UStream, Twitch, Twitter, Akamai and CDNVideo. Featuring simplified practical operation, flexible Internet connectivity and mobile operations, the SE510 delivers no key-in configuration and one-click live streaming for unhindered streaming operation. Both wireless and wired access is supported for anywhere-anytime, portable video-on-demand and digital signage applications. AVerMedia’s product design work has been honored with numerous prestigious awards local and international awards including the latest from the 24th gathering of the Taiwan Excellence committee. SE510 incorporates technology to keep broadcasters connected to the Internet and provides simplified streaming and capturing functions. By offering mobile operations and management, the SE510 is the versatile solution for video-on-demand and live streaming solution providers.